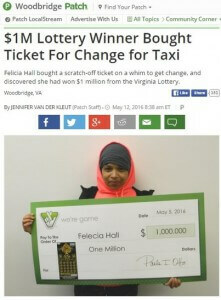 Next time you find yourself needing change, go to the nearest lottery outlet and purchase a ticket. This proved lucky for Felecia Hall when the ticket she purchased in a bid to get loose change landed the top prize of the Golden Spades instant game. Hall was already at the restaurant when she discovered her good fortune, and found herself struggling to breathe. Since then she has opted to receive a one time payment of $561,798 before taxes. She plans to use the money to help family. The Connie’s Triangle outlet received a $10,000 bonus for selling the winning ticket.